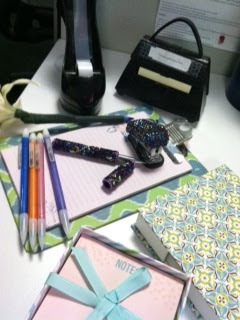 When one must work within the confined space of a desk, it is fun to have feel good items to surround yourself with. I work in an office setting and since the day I stepped into this setting I have been accumulating many-a-office supplies. Anything glitzy, anything to jot numerous notes a day on, anything that makes my heart sing, well I'm all for it. I'm happy to say that while I have purchased many items for Le desk of mine, I have also been gifted tons too. I get very happy when I receive an item someone saw that made them think I would appreciate it. I believe if more professionals had more fun desk flair, they would be eager to get to work to use it. I'm not saying you need a pinata above your head, but I mean slight improvements would be a good start. 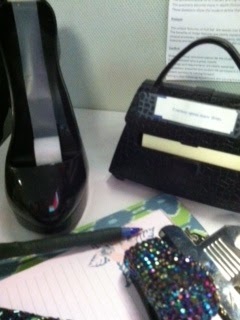 Say, for example, you have a stapler on hand, why not doll it up with a little sparkle? Who doesn't like sparkle???? When I hand mine over and I sense judgement, well, I am definitely taking note of who your character truly is. Do you hate chubby babies and funfetti cupcakes too? After 3 years as a young professional, I'm proud to say I'm professional my way and I've got the desk decor to prove it. Now run, be free, hit up your neighborhood Target and Pier 1 Import to find snazzy tidbits to doll up a little. Hunty snagged my tape dispenser and my sticky note purse a couple years ago. What can I say? My boo knows the way to heart, my feet and arms many times over. When faced with the choice of regular #2 pencils, obvi you should find the jazzy glitter ones. Obvi. Fun stationary? Check, check. Hunter's momma Sharon, or Shanizzy as I call her, gifted me this fab pen she scored at Pier 1. Lovessss it. It goes perfect with the stapler Courtney, H's sister gave me a few years back for a bday. I Loveeeee these people! Inspiration and love on your walls, amiright? Nuff said. A nice desk lamp and an organized contraption to store said fab pens and glitter pencils. Keeps it clean and bright folks. 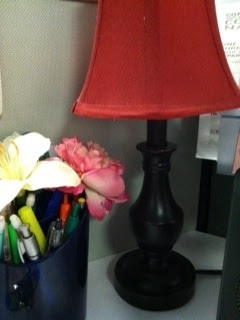 An old coworker gave me his lamp when he moved roles bc I had admired it for many moons. See? Pays to be a weirdo who compliments others' desk attire. 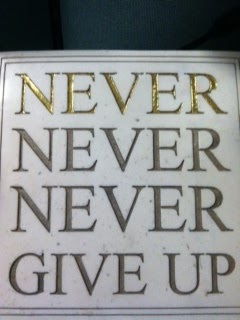 My momma found this for me a few Christmases ago. It's short, simple, and I look at it each and every day. It's applies to so much. Thank ya Momma Knizzy. That is it for today. I'm off to edit some video footage of the a City Council meet and greet and to the water tomorrow. I cannot wait to see some babies stick their little chubby toes in some sand and water. Excelleenttttt. Happy Weekend!